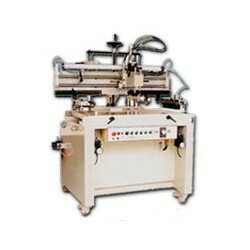 Manufacturer and Designer of Screen Printing Machines and Peripheral Equipments. For printing single-sheet products such as PCBs (FPCBs), transfer-printing paper, OPP, PS, PU, PVC, flexible synthetic leather, copper foil, aluminum foil, wood panels, glass, metal plates, stickers, acrylic panels, etc. 1. The machine is designed with strong and durable structure; stable and less vibration. 2. Equipped with the timer which can be adjusted to automatic printing processing. 3. Easy adjustment and operation. 4. The pneumatic squeegee set can lift automatically to prevent from rubbing screen surface when lowering. 5. suitable for single sheets such as : circuit boards (FPC), PC boards , transfer paper, OPP, PS, PU, PVC, soft plastic leather, copper foil, aluminum foil, wooden boards, glass, sheet iron, self- adhesive labels, acrylic etc. 6. Voltage : 110V, 220V 1 or 3 phase.